Dust control is something you know you should do, but where do you start and how do you proceed? You’ve probably asked yourself questions like, do I need a central system, what about grounding and how much is this going to cost? 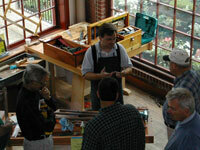 For years we’ve searched for professional quality, western style carpenter’s saws. You know, the kind Disston, Stanley and Sandvik used to make. We are excited to introduce a new educational series, Saturday Mornings at Highland Woodworking, to complement our current class offerings.